Stay informed of all of the exciting events and insightful sessions the Technology & Services World conference has in store. Apply to speak at the technology industry's premier networking and learning event. * Schedule and speakers are subject to change. Please check back for updates. The TSW San Diego 2019 conference is designed to help technology and services leaders network, share ideas, and learn about the latest trends in the industry. Our 2019 agenda will cover these priority topics. Optimizing the renewal motion within customer success. Customer success in the sales process. Accelerating customer success at scale. Customer success teams efficiently using technology and automation. Adoption techniques for a specific industry customer segment (i.e., healthcare, manufacturing, etc). Improving customer experience within the product. Beyond the smile sheets: How is ES measuring value? This can be value to the company via customer retention rates, product subscription renewal rates, or reduced call volumes into support. Or, it can be value as demonstrated to the customer via improved productivity, shorter time to project completion, decreased calls into support, or improved efficiency. Partnerships: How is ES partnering with other service lines to enhance or improve the customer experience? How have these service combos been monetized, or not, as the case may be? If monetized, how is ES awarded revenue? How has the customer experience been impacted by joint offers between service lines? Academic alliances: Many ES organizations are looking to influence the next-generation worker via academic alliance programs. What type of program do you have, and how long have you had it? Has it been successful? How do you measure success of the program? What is the basic construct of the program? How did you get in the door at various universities, etc. Driving adoption: How is ES helping to drive product adoption? What offers has ES created to drive adoption? How is ES tracking the correlation between training and product adoption? Data: What type of data is ES collecting to enable sales and marketing decisions? How is data used to develop new ES offers or to identify gaps in existing offers? Does ES use a dashboard, and if so what data is displayed in the dashboard? Is the dashboard used at an executive level outside of ES? Technology: More and more, technology is a factor in providing robust education offers, particularly for online learning and content development. What type of technology is ES using in the provision of its learning and content development, whether it is online or instructor-led training content? The partnership between sales and services. Engaging services and customer success in the sales process. Using data to find new opportunities with existing customers. Driving upsells with services and customer success. Generating leads through service and customer success interactions. Moving from free to fee with differentiated field service offers. Best practices to enable same-day spare parts deliveries. Measuring and improving customer satisfaction, including transactional and relationship surveys, NPS, customer effort, and operational metrics. Best practices in monetizing IoT services. Best practices in overcoming the security concerns of customers to improve connectedness. Maximizing productivity through mobility tools. Successful plays for managed services and the channel. Enabling sales to successfully sell managed services. Evolving your economic engine from product to managed services. DevOps and ITIL in a managed services world. Successfully scaling customer success for managed services. Next-generation automation in the delivery of managed services. Best practices in professional services partner identification and enablement. Next-generation resource management and capacity planning. Accelerating customer time to value through professional services best practices. Services and sales linkages optimized to increase company revenue growth. Optimizing professional services for XaaS. Harmonizing renewal practices and support offers with mergers and acquisitions. Taking on renewal of subscription plans. Transitioning customers to new service offers. Creating offers with distinct value propositions via a service portfolio continuum. Automating renewals for the long tail of small-dollar contracts. Changes to compensation can drive subscription offer growth. Developing a strategy to increase subscription sales. Account and offer segmentation to drive demand. Sales operations to support the shift to selling subscriptions. Making the shift to proactive outcome-based selling. Supporting the channel to sell subscription offers. Aligning marketing, sales, and product for subscription offer growth. Digital transformation is creating the necessity for increased focus on the frontline teams; what are support organizations doing? Case studies on solution design, rollout, adoption, use, and compliance. How have support organizations involved their workforce in all phases of transformation? Support skills management and training: Skills management and training; what are companies doing as attrition rises, workforce turns over, and training is being consumed differently. Cross-business unit success: Product serviceability/supportability, customers demands, sales pressure…how are support organizations crossing the business lines? Share effective stories of cross-team collaboration to drive results. XaaS: Case studies, success stories, best practices, and highlights on organizational design and implementation of new support models to move to XaaS support. Support technology: Live demos and use cases for extreme automation and success with a well-implemented support technology stack. Employee loyalty programs: What does a great employee loyalty program look like? Knowledge management: Innovative approaches to knowledge management; case studies on data, information, learning on-demand, in-app user guidance and support, best practices, customer issue resolution. Women in support services: What programs have been put in place to highlight, support, and advance women working in support services. Support outsourcing: How to do it well, how to recover from a bad experience, best-case and success stories welcome. Support outsourcing: How to do it well, how to recover from a bad experience, best-case and success stories welcome. Driving XaaS cultural and skills shift. The role of AI and automation in driving business scale. XaaS revenue attribution methods. Budget formation. Case studies on the business transition journey from license to subscription. The role of segmentation in product design. Building the business case for subscription offerings. Success stories with artificial intelligence. So far, AI has been more hype than reality. There is a great deal of interest in how companies are successfully leveraging AI to improve service operations and intelligence. Examples include intelligent routing for service requests, contextual intelligence, product interventions, knowledge management and its impact on self-service success and employee KM, results from live chat bot implementations, leveraging AI to build predictive staffing models, and forecasting revenues (maintenance, renewals, managed services, professional services) using AI. Digital transformation. 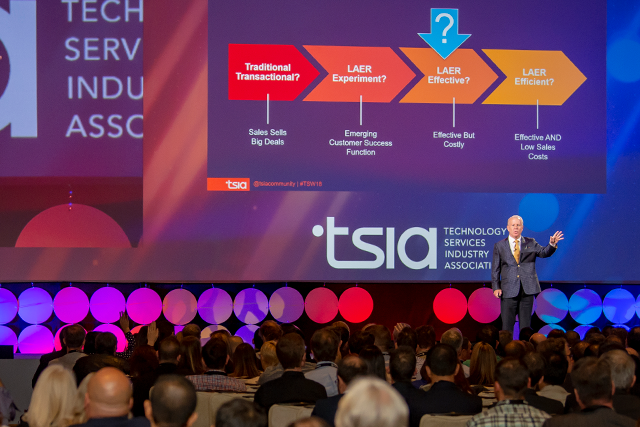 While CIOs seem very focused on what digital transformation means for internal operations, TSIA members are asking how digital transformation can be leveraged to improve the customer experience. We would love to highlight real-world success stories including moving customers to digital and mobile channels/devices, boosting employee productivity and customer outcomes with enhanced mobility, digital self-service strategies, impact of digitalization on sales and renewals, etc. Using predictive analytics to prevent churn and create expansion opportunities. Analytics that drive customer success. Common sense rules for automation before turning services into a sales engine. Applying success science to offer design. Driving the product roadmap with data analytics. Developing employee behaviors to facilitate and support employee career direction and growth. Keys to millennial employee engagement; providing a path to career growth within support services. What new and innovative recruiting and professional development practices are being implemented within companies? What are companies doing to identify and invest in their next-generation leaders? Support 101 for individual contributors and managers: Back to basics are good for ICs and managers. What tools matter, what metrics are key to driving the right behavior, what metrics may bring about the wrong behavior? What key processes and people skills need to be front of mind? Case studies and best practices are welcome. How to groom leaders: What are the top five things someone moving into support leadership needs to know? Examples include support funding, and building cross line of business (x-lob) relationships, etc. The Call for Speakers for Technology & Services World San Diego 2019 is currently closed. If you have questions or are interested in speaking, please contact Christi Holzer, Senior Manager, Conference Programs and Technology.